New Philharmonic, under the baton of Maestro Kirk Muspratt, completes its 2014-2015 season at the McAninch Arts Center, 425 Fawell Blvd., with Bach to Bock, Saturday, April 18, 8 p.m. and Sunday, April 19, 3 p.m. There will be a free MAC Chat prior to each performance. Works performed will include Jerry Bock and John William’s legendary Cadenzas from “Fiddler on the Roof” and Ralph Vaughn-Williams’ sweetly exhilarating “The Lark Ascending,” featuring guest violinist David Taylor, assistant concertmaster of the Chicago Symphony Orchestra. Taylor will be joined by featured oboist Kevin May for the concert opener, Johann Sebastian Bach’s “Double Concerto for Oboe and Violin,” a composition known for its timeless tenderness. In conjunction with NP’s ongoing commitment to showcase some of the area’s most talented youth musicians, Hinsdale’s-own Hugo Zoells and Sophie Lekas will take the stage for a post-intermission Youth Spotlight performance of one of Bach’s most well-known works, “Concerto for Two Violins in D minor.” Then, the Sinfonia orchestra of Wheaton-Warrenville South High School will join NP on stage for a “side by side” performance of Felix Mendelssohn’s world famous “Wedding March from Midsummer Night’s Dream.” NP’s performance of Mendelssohn Symphony No. 3, op. 56, in A minor, which was inspired by Scottish folk music and dance, will complete the program. 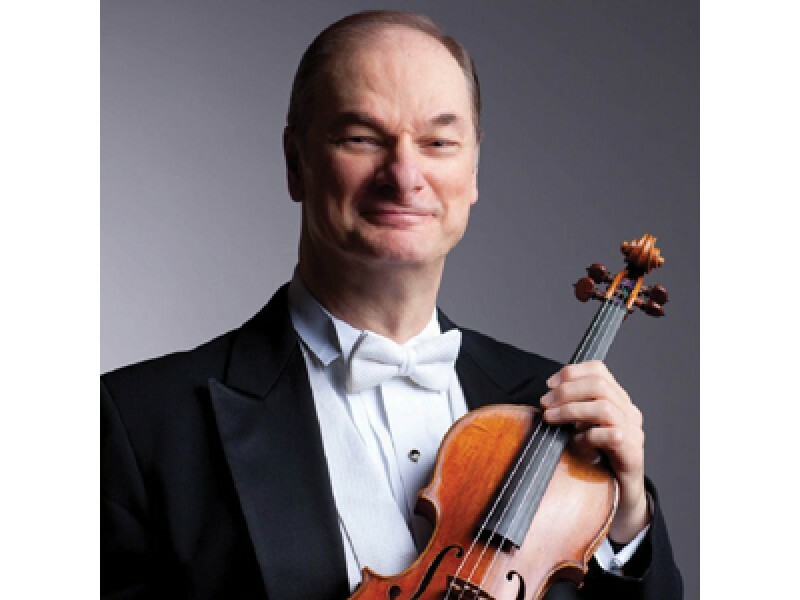 David Taylor joined the Chicago Symphony Orchestra as assistant concertmaster in 1979. Born in Canton, Ohio, he first studied violin with his father beginning at the age of 4, and later continued his studies at the Cleveland Institute of Music. He later studied at the Juilliard School, where he received both bachelor and master’s degrees. He became a member of the Cleveland Orchestra in 1974 as a first violinist. With the Chicago Symphony he has made numerous solo appearances, including performances with Sir Georg Solti. He also has served as acting-concertmaster of the Saint Louis Symphony and Concertmaster of the Milwaukee Symphony. Taylor is the Concertmaster of the ArsViva Chamber Orchestra. As a lover of chamber music he often performs in recitals and solo performances in the Chicagoland area, at Ravinia and on WFMT. He performs often with the Pressenda Trio with fellow CSO cellist Gary Stucka and pianist Andrea Swan and is a frequent soloist with the region’s local orchestras. He teaches privately, at the Moody Bible Institute and at Roosevelt University. A frequent coach of orchestral violinists he has students in orchestras across the U.S. and Japan. He plays a J.B. Guadagnini violin made in 1744. Kevin May is a Villa Park native. As a student he performed with the DuPage Youth Symphony and Chicago Youth Symphony Orchestra. May holds a Bachelor’s degree in Music Performance from the Eastman School of Music and a Master’s Degree from Yale University School of Music. He has performed as a featured soloist with the Music Academy of the West and the Macau Orchestra and has participated in festivals throughout North America, including Sarasota Music Festival and Banff Summer Arts Festival. May spent three years as 2nd Oboe/ English horn with the Macau Orchestra in the Macau Special Administrative region of China during which time he also performed as a guest artist with the Hong Kong Symphony Orchestra. Currently, he plays Principal Oboe with the New Philharmonic, and freelances in the Chicagoland area. New Philharmonic, under the baton of Maestro Kirk Muspratt, completes its 2014-2015 season at the McAninch Arts Center, 425 Fawell Blvd., with Bach to Bock, Saturday, April 18 at 8 p.m. and Sunday, April 19 at 3 p.m. Performance tickets are $46. A limited number of $10 student tickets will also be available, with valid student ID. A free MAC Chat will precede each performance. To order tickets or for more information, call 630.942.4000, or visit AtTheMAC.org. The MAC Wants to Know: Who Do You Want to See In 2015–2016?